My family loves bread. Whenever I get a chance I try and make them rolls or bread with their meal. There is nothing as tasty as homemade bread. Even though nothing is as tasty I do have some bread recipes that are quick and semi homemade. 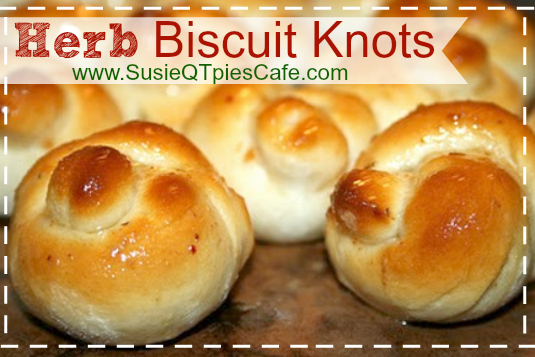 These herb biscuits knots uses refrigerator dough and are great! Everyone loves them and I got the recipe from Rush-Hour Recipes by Gooseberry Patch. Cut each biscuits in half. Roll each piece into a 6-inch rope and tie in a loose knot. Bake at 400 degrees for about 9-11 minutes, until golden. Immediately brush oil mixture over warm biscuits; brush again. Serve warm. Makes 20.